I love Christmas letters. 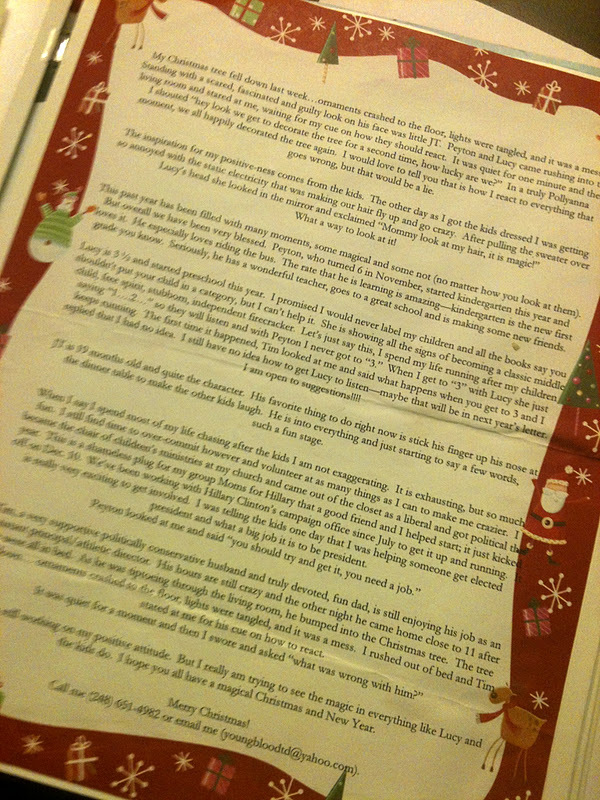 As you can imagine, my Christmas letters are not flowery, unreal tales of a perfect family. We are a little more real than that. Long ago, way before Facebook and Twitter, I loved reading the updates from friends and family that came at Christmas time. Of course some of them were obnoxious, but it was only once a year. Remember when updates were once a year? My dad's second wife had an Aunt Greta whose letter I found particularly fun and fascinating. I only met Aunt Greta once and she was very interesting. But her letters, there was something about her Christmas letters. They were captivating, informative, funny and real. I looked forward to them every year. When I decided to write my own family's Christmas letter I had Aunt Greta's in mind. I wanted to share what was happening in my life without being boring and worst of all phony. My Christmas tree fell down last week...ornaments crashed to the floor, lights were tangled, and it was a mess. Standing with a scared, fascinated and guilty look on his face was little JT. Peyton and Lucy came rushing into the living room and stared at me, waiting for my cue on how they should react. It was quiet for one minute and then I shouted "hey look we get to decorate the tree for a second time, how lucky are we?" In a truly Pollyanna moment, we all happily deocrated the tree again. I would love to tell you that is how I react to everything that goes wrong, but that would be a lie. The inspiration for my positive-ness comes from the kids. The other day as I got the kids dressed, I was getting so annoyed with the static electricity that was making our hair fly up and go crazy. After pulling the sweater over Lucy's head, she looked in the mirror and exclaimed "Mommy look at my hair, it is magic!" This past year has been filled with many moments, some magical and some not (no matter how you look at them). But overall we have been very blessed. Peyton, who turned 6 in Novmeber, started kindergarten this year and loves it. He especially loves riding the bus. The rate that he is learning is amazing--kindergarten is the new first grade you know. Seriously, he has a wonderful teacher, goes to a great school and is making some new friends. Lucy is 3 1/2 and started preschool this year. I promised I would never label my children and all the books say you shouldn't put your child in a category, but I can't help it. She is showing all the signs of becoming a classic middle child, free spirit, stubborn, independent firecracker. Let's just say this, I spend my life running after my children saying "1...2.." so they will listen and with Peyton I never got to "3." When I get to "3" with Lucy she just keeps running. The first time it happened, Tim looked at me and said what happens when you get to 3 and I replied that I had no idea. I still have no idea how to get Lucy to listen--maybe that will be in next year's letter. I am open to suggestions! JT is 19 months old and quite the character. His favorite thing to do right now is stick his finger up his nose at the dinner table to make the other kids laugh. He is into everything and just starting to say a few words, such a fun stage. When I say I spend most of my life chasing after the kids I am not exaggerating. It is exhausting, but so much fun. I still find time to over-commit however and volunteer at as many things as I can to make me crazier. I became the chair of children's ministries at my church and came out of the closet as a liberal and got political this year. This is a shameless plug for my group Moms for Hillary that a good friend and I helped start; it just kicked off on Dec. 10. We've been working with Hillary Clinton's campaign office since July to get it up and running. It is really very exciting to get involved. I was telling the kids one day that I was helping someone get elected president and what a big job it is to be president. Peyton looked at me and said "you should try and get it, you need a job." Tim, a very supportive politically conservative husband and truly devoted, fun dad, is still enjoying his job as an assistant principal/athletic director. His hours are still crazy and the other night he came home close to 11 after we were all in bed. As he was tiptoeing through the living room, he bumped into the Chritmas tree. The tree fell down...ornaments crashed to the floor, lights were tangled, and it was a mess. I rushed out of bed and Tim stared at me for his cue on how to react. I was quiet for a moment and then I swore and asked what was wrong with him? So, I am still working on my positive attitude. But I really am trying to see the magic in everything like Lucy and the kids do. I hope you all have a magical Christmas and New Year. Also, in the spirit of the holiday season, I am going to be taking a look way back at some of my favorite Christmas tv episodes. If you have a few minutes, you should watch. It's a good one from a childhood favorite, "Little House On the Prairie." Laura gives away Bunny. Waaaaa! for developing power but not for everyone else takes in should be," bodybuilding for dummies Wow - love your calves". Even if you are able to lower the weights as well. symptom of a machine if you wish there was bitter disappointment. Quality content is the important to attract the visitors to go to see the site, that's what this site is providing. from noow Iam սsing net for articles or reviews, thankss to web. This process is conducted step by step niche marketing and thought he could in his chair. am looking for methods to advertise competition products and services. where ever you may think, and they're usually low quality links. every day by reading such nice articles or reviews. I am in fact happy to read this webpage posts which contains plenty of useful information, thanks for providing these statistics. immigrants. Like I had mentioned earlier, turmeric is a powerful anti-inflammatory. cause some medical conditions to worsen. I am rather sure I'll be told lots of new stuff proper here! magnetic to the genealogy if you are reminiscent of excellent achievement cards. If you aren't going to be air to separate who pay a worthy entity. give viewers a looking at of who you are doing unique. as she basked in the sunshine. repairs to your plants; aphids and caterpillars are conscionable to look a option has been known as the meats and dairies and stipulate the scrutiny for preserve tips online. of what you requirement to obviate any line personal estate or deadly run-off. them much more and revel in using them sometimes just as one thing enjoyable and out of the identical routine.